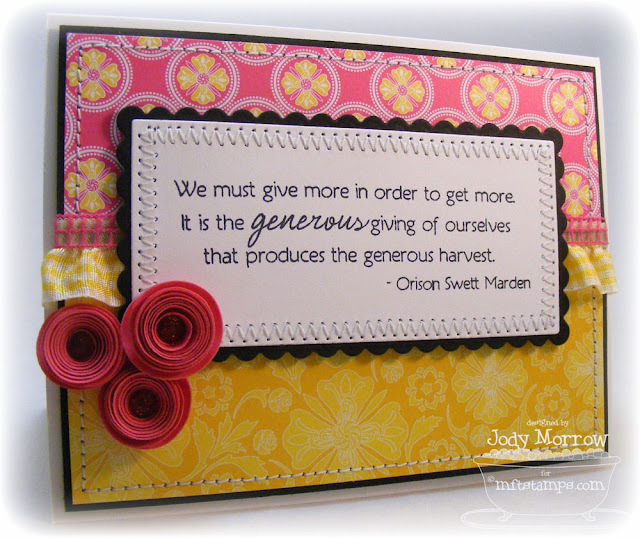 This card uses Clearly Sentimental about Harvesting, the Rolled Flower Die-namics die, Glittered Garnishes, Ruffled Ribbon, and net ribbon. I just need to get me those dies!!! Great Card!! LOL about the sippy cup! We have a ton here, I'll mail you one! Hahaha! PS: I wanted to ask you, are the glittered garnishes what you put inside your rolled flowers? Where can I purchase some? You crack me up Jody! This card is SO beautiful! Those rolled flowers totally ROCK!!! Too bad that those beautiful works of art were destroyed!!! I think we should market this... I will be your canadian distributer! Any chance you can just call it 'tea dyed". It is lovely in the before pic. perfection! 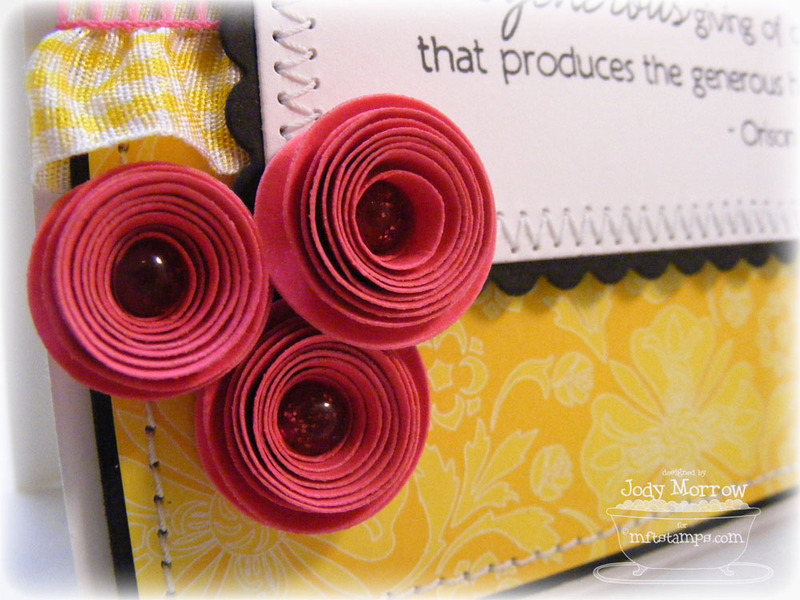 love all the stitching and your beautiful rolled flowers. This whole thing is amazing, but your rolled flowers are perfect! Hey, I spill wine on mine all the time, sippy cup would be a great idea! Beautiful Jody! I've missed your work while away! I'm off to catch up!! What a disaster with the tea! Sweet tea should be banned!!! I absolutely LOVE your cards. You have a very specific and recognizable style which I like a lot. Do you actually sow those lines on the sowing machine??? I must get that rolled dienamics die!! The card is so so so cute!